The Free West Papua Campaign is very pleased to announce that today, Victor Yeimo, the Chairman of the West Papua National Committee (KNPB) was finally released from prison after serving more than a year in jail. 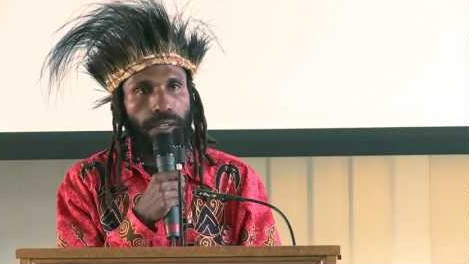 Victor has spent many years of his life in prison for peacefully campaigning for a Free West Papua and he was last jailed in May 2013 on charges of “treason” after he lead a protest to demand justice for West Papuan activists who had been recently murdered in the town of Sorong. Upon arrest, Victor was severely tortured and later sentenced to three years in jail. After one year in jail, the authorities decided that he would be released but remain on parole until 2016. Victor became the Chairman of the West Papua National Committee in 2012 after his predecessor, Mako Tabuni was shot dead in the street by the Indonesian special forces. Victor has led mass peaceful protests and public demonstrations around the country and given talks internationally about the freedom of his people. Victor was released at 10:30 this morning from Abepura Prison and greeted by crowds of supporters flocking to see him and witness his release. “The KNPB will continue to fight for a referendum to take place because we have the right to self-determination.” said Agus. “In court the prosecution could not prove that I committed assault so I was only sentenced to one year but they appealed and I was sentenced to three years,” said Victor. He confirmed that during the process of his arrest, he was terrorised and terribly beaten by the Indonesian security forces. 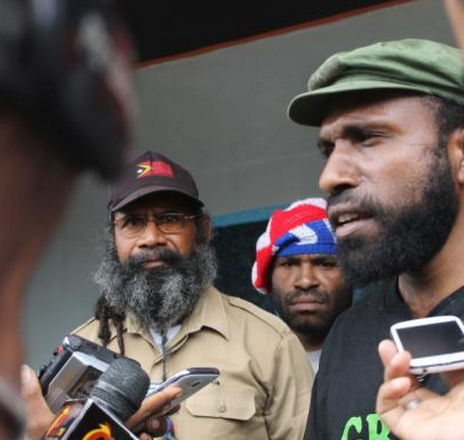 This historic news of his release comes after widespread international support and public appeals for the freeing of Victor and all West Papuan political prisoners. We would like to thank you all for all the letters you have written, phone calls you have made, protests you have attended and countless other ways in which you have supported the release Victor Yeimo and his fellow prisoners. After such support, five more West Papuans, known as the “Jayapura 5” were also released recently after serving 3 year long jail sentences for organising a peaceful pro-independence congress in October 2011. However, the Indonesian government continues to arrest, torture, detain and jail scores of other West Papuans just for standing up for the freedom of their people. To find out how you can support the Papuans who are still in jail, please visit Papuans Behind Bars, an organisation dedicated to supporting the welfare and release of all Papuan political prisoners. Papuans Behind Bars spreads awareness about how people across the world can take action to support West Papuans who are being jailed simply for expressing their rights. Some of these political prisoners are serving decades behind bars just for calling for a Free West Papua. Victor are no quieter in jail, nor after serving long jail sentences. 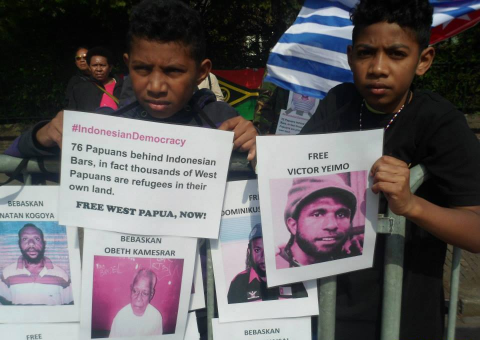 Like Victor, his friends and the millions of West Papuans both inside the country and in exile; the Free West Papua Campaign will continue to struggle for self-determination and independence for West Papua so that one day every Papuan will finally be free.